Photo: Jim Hogan In note (ix) to our List 1, we mention how Knowlton was the winner of a competition organised in 1914 by the Weekly Dispatch to find the "Bravest Village in the United Kingdom". The "Bravest Village" was defined as the one from which the largest proportion of its men volunteered to serve in the armed forces before 28 February 1915. Nearly 400 villages competed. The prize was a cross of Aberdeen granite about 17 feet high, with the figures of a soldier, a nurse, a casualty, and Victory at the top of the column, and a Roll of Honour on the plinth. The then Attorney General, Lord Birkenhead, judged the competition and decided that Knowlton should be the winner, with - according to the inscription on the plinth - 12 men enlisting from a total population of 39. The cross was unveiled on 1 September 1919 by Lord Stanhope, and still stands at the side of Sandwich Road, Knowlton, at Grid reference TR 275536. The unveiling is described in The Times of 8 September 1919 under the heading "Bravest Village. Memorial Unveiled at Knowlton, Kent". In this article, Knowlton is described as a "beautiful village", but also as "an old but diminutive hamlet". Both the adjectives are true, but "hamlet" is certainly more accurate than "village". 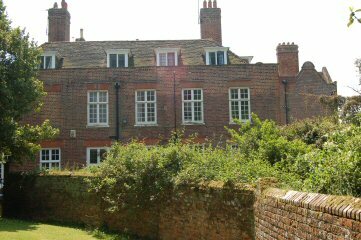 Knowlton was an estate dependent on a manor house, Knowlton Court, with a farm, a lodge (built in 1912 by Lutyens), a dower house, two cottages, and an interesting mediaeval church, St. Clement's, now cared for by The Churches Conservation Trust. It remains in occasional use. The Rector of Knowlton lived at Chillenden, a picturesque village about a mile west of Knowlton..
Little has changed over the centuries since Knowlton was recorded in the Domesday Book. The present manor house was built by Sir Thomas Peyton in 1585, with some rebuilding in 1785. In the late 17th Century, the estate became the property of Admiral Sir John Narborough. He died at sea, leaving a widow and two sons. Lady Narborough then married Admiral Sir Clowdisley Shovell. On the foggy night of 22 October 1707, Admiral Shovell's fleet of 5 ships returning from Gibraltar struck the Scilly Islands. Four of the ships sank, including the flagship HMS Association. Sir Clowdisley and his two Narborough stepsons lost their lives. (These two men are commemorated in St. Clement's by a memorial which is ascribed to Grinling Gibbons.) The estate then passed to the D'Aeth family who owned it until 1904 when it was bought by Elmer Speed. So how did this "diminutive hamlet" with a total population of 39 produce 12 men to join the colours at the beginning of the Great War, i.e. 30.8% of its inhabitants? The first name on the Roll of Honour is Major F.E. Speed. Francis Elmer Speed was born 28 February 1859 and so was 55 years old in August 1914. He was the Squire of Knowlton and the High Sheriff of Kent. He is reported in the Weekly Dispatch as saying "I very soon made it known that I thought every man ought to go. They joined up in a very few weeks". Martin Middlebrook in "The First Day on the Somme", page 7, writes "In the country areas, men were sometimes given little choice in the matter. The local land-owner often selected men from his domestic staff or farm labourers and took them to the nearest recruiting office. The men involved accepted with few qualms". Squire Speed was evidently from this mould. But there was another man in the district who also had a marked effect on recruitment: the 13th name on the Roll of Honour, Major S.G.H. Sargent CF. [CF indicates "Chaplain to the Forces"] According to Crockford's Clerical Directory, the Rev'd Sidney George Hewlett Sargent, MA of Trinity College Dublin, became Vicar of Nonington in 1891. Nonington is a village 2 miles south-west of Knowlton; in 1891 it had a population of 740. The Rev'd S.G.H Sargent became Rector of Knowlton in 1904, holding the two benefices of Nonington and Knowlton in plurality. In the 1901 Census of Nonington, his age is given as 48, so he was 61 or 62 in August 1914. He served as Chaplain to the 2/4th Buffs which, as part of 202 Brigade of the 67th (Home Counties) Division, was engaged on home service only. Martin Middlebrook had a holiday in 2001 at Nonington. He made "A study of a typical Kentish village's losses in the First World War" [27 men] - for full text Google Middlebrook+Nonington. He comments "A study of Nonington's First World War dead shows an unusually large proportion of very early wartime volunteers" and further "One wonders whether the fact that Kitchener's home was in nearby Barham influenced this". But it wasn't Kitchener's proximity, but Sargent's presence which had the effect. In the journal "Bygone Kent" of 15th August 1994, there is an article "Britain's Bravest Village" by John Viner. He says on p459 "Despite Major Speed's assertion that the men answered his call to the colours, it is highly likely that it was to the Rev'd Sidney Sargent that they responded. He had made a strong appeal to the men of Nonington, many of whom joined up". An article written at the time the prize was awarded was printed in the 1916 Year Book of the Association of Men of Kent and Kentish Men. This was "The Bravest British Village" by A.O. Collard. He writes "All honour to . . the white-haired Rector, the Rev'd S.G.H. Sargent, who held a recruiting meeting and obtained, in this sparsely populated district, 100 voluntary recruits". This article also includes the same list of names and regiments as on the Knowlton Roll of Honour BUT the list has only eleven names. There is no mention of Private A. Wood or of Major S.G.H Sargent. So Private Wood must have joined up after the competition's closing date of 28 Februry 1915. The true proportion thus appears to be 28.2%, not 30,8%. Where did these eleven men come from? Major Elmer Speed and his two sons, John and Douglas, lived at Knowlton Court. An information board on a wall near St. Clement's Church gives a brief history of Knowlton. About the Bravest Village Competition it says "Few of the men actually lived in Knowlton, although they all worked on the estate". John Viner, in the Bygone Kent article quoted above, diligently traces the residence of each of the enlisted men. They were all employed on the Knowlton estate, but only one lived there: "To Charles Baldock goes the honour of being the only enlisted man to actually reside at Knowlton. He lived at Home Farmhouse with his mother". He is said to be a gardener. So it is FOUR men of Knowlton, not 12 or even 11. The proportion is really 10.3%. John Viner also writes (p456) "When the monument was erected in September 1919, there was some local controversy in the villages around that the memorial had been obtained under false pretences as, the Speed family aside, all the other men named on the monument had lived in the neighbouring villages of Chillenden, Rowlings and Eastry". The 1911 Census lists only four of the men named on the monument as living in Knowlton. They are Francis Elmer Speed age 52, John Leyland Speed age 18, Douglas Leyland Speed age 17, and Charles Baldock age 31. This confirms John Viner's statement in his Bygone Kent article quoted above. Two questions arise from the above discussion. (1) Is a group of a manor house, dower house, lodge, farm and two cottages to be classified accurately as "a village"? (2) If not all the men who volunteered in 1914/15 actually resided in Knowlton, is this community the fair and just winner of the Bravest Village Competition? Knowlton was Thankful, but was it a "Thankful VILLAGE"; and was it "The Bravest"? We leave the answers to the consideration of our readers. ONE CROWDED HOUR OF GLORIOUS LIFE IS WORTH AN AGE WITHOUT A NAME: THIS CROSS WAS ERECTED IN HONOUR OF THOSE TWELVE MEN OF KNOWLTON WHO OUT OF A TOTAL POPULATION OF 39 ENLISTED PRIOR TO MARCH 1915 AND BY THEIR PATRIOTIC ACTION WON THE WEEKLY DISPATCH BRAVEST VILLAGE COMPETITION.